The United States Anti-Doping Agency (USADA) announced today the unanimous decision by an independent three-member panel from the International Court of Arbitration for Sport (CAS), the highest court for Olympic sport. 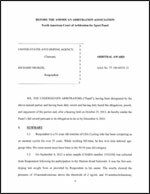 The CAS panel rejected the appeal filed by Justin Gatlin of Pensacola, Fla. which sought to reduce the period of ineligibility, handed down on December 31, 2007, from four years to two. While the four-year period of ineligibility remains the same, the December 31, 2007 decision has been amended, changing the start date from May 25, 2006 to July 25, 2006, the date on which Mr. Gatlin voluntarily accepted a provisional suspension, making the four-year period of ineligibility July 25, 2006 through July 24, 2010. In addition, all of Mr. Gatlin’s competition results are cancelled from the date of the sample collection on April 22, 2006 until the commencement of this amended ineligibility period. In August 2006, Justin Gatlin of Pensacola, Fla., agreed to the accuracy of the laboratory results from his sample collected by USADA on April 22, 2006 at the Kansas Relays, which tested positive for exogenous testosterone. All anabolic agents, including testosterone and its precursors, are prohibited under the USADA Protocol and the rules of the International Association of Athletics Federations (IAAF), the international federation for the sport of track and field, both of which adhere to the World Anti-Doping Agency (WADA) Prohibited List. USADA and Gatlin agreed at that time to a maximum sanction of eight years ineligibility for Gatlin’s positive drug test, which was his second doping offense, and agreed that Gatlin could seek a reduction in the eight-year period of ineligibility through the established arbitration process under the USADA Protocol for Olympic Movement Testing. Through the arbitration process, the December 2007 decision set Gatlin’s ineligibility period at four years, and Gatlin forfeited his competitive results on and subsequent to April 22, 2006, including his world-record-equaling performance (9.77 seconds) in the 100m at the Qatar Super Grand Prix in Doha on May 12, 2006 and his title as 2006 USA Outdoor 100m Champion.